The newest Magic: The Gathering set, Dark Ascension is released to the general public on Feburary 3rd. To whet your appetite, we doing a series of previews on Dark Ascension. Today. We highlight some of the new Black and Red cards you’re bound to see when you open a pack. Please note that you can click on any of the pictures in this preview to view a large, higher definition version of the card in question. The theme of Dark Ascension is very similar to the old Ravenloft Dungeons & Dragons campaign setting. 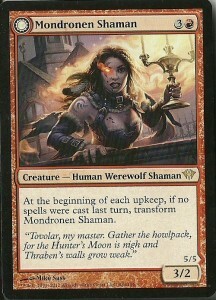 It’s the second in the Innistrad block and this time, the werewolves and vampires are even more powerful. With these type of creatures dominating the world, you can definitely expect Black to take center stage this time around. 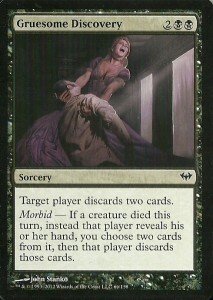 For all intents and purposes, Gruesome Discovery is very similar to Mind Rot or Waking Nightmare. All three cards cause a target to discard two cards. Gruesome Discover however costs an extra black mana. So why go for it? Because of the Morbid effect on the card. If a creature from any side dies in that turn, the opponent must reveal their entire hand and you can pick and choose which cards to get rid of. This makes Gruesome Discovery great with weenie decks, a Pestilence themed deck, or any sort of control/discard themed deck. Is it worth an extra mana to cast? Under those circumstances – definitely. 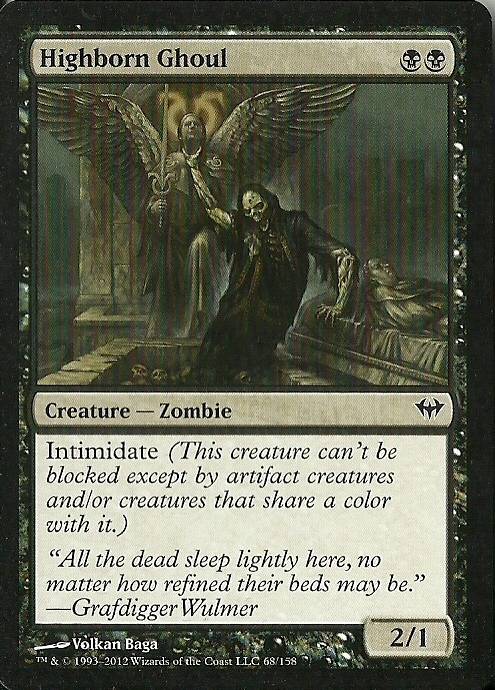 If you or your opponent are not playing decks with high creature turnover however, you might be better off with one of the aforementioned similar cards. 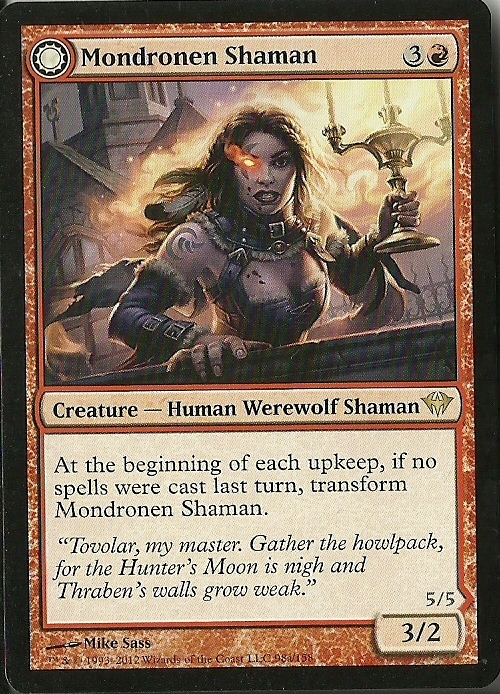 For two mana (one black and one colourless), you have an enchantment that causes an opponent’s creature to enter into a Tomax/Xamot like relationship with its owner. Any damage that creature takes, the controller takes as well. 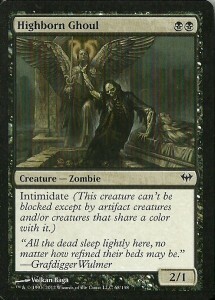 Obviously you wouldn’t want to waste something like this on a 1/1 creature and it might be easier just to use something like terror to eliminate a pest from your opponent’s creature collection, but this definitely has uses. But it on a creature that has to attack every round and has a lot of life and its controller is in for a world of hurt. This also works really well with Pestilence…as do a lot of black cards in Dark Ascension oddly enough. 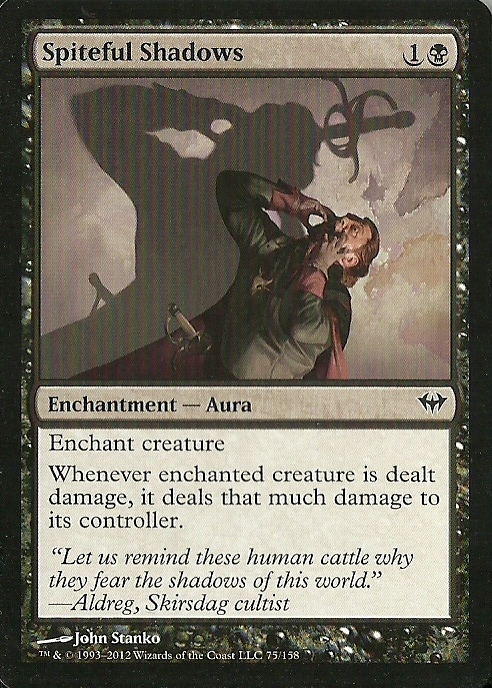 It will definitely take a specific deck to use Spiteful Shadows correctly, along with a bit of luck as its usefulness depends almost completely on what your opponent plays, but in the right circumstances, this can be a huge game changer. Man I feel old as I can remember when the only vampire was a Sengir one. My how times have changed. Now there are roughly three dozen vampires. The Vengeful Vampire is just one of many in Dark Ascension. For a total of six mana, he’s pretty pricey compared to older and possible better Kindred. He’s only a 3/2 flyer after all. If it dies however, it instantly comes back onto the battlefield as a 4/3 creature. 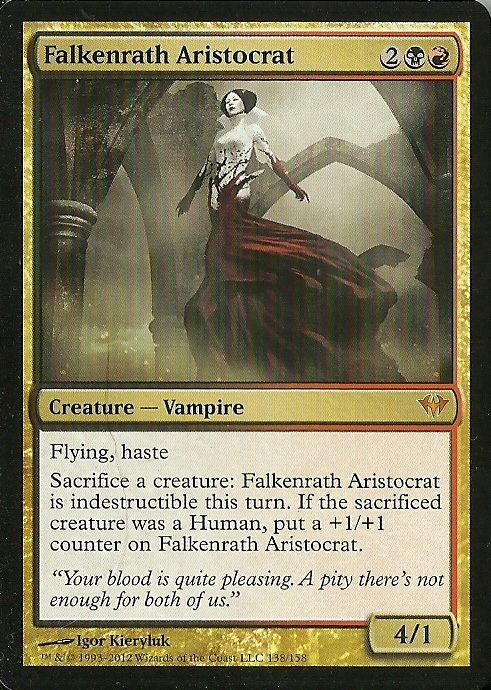 That’s kind of a neat ability, but overall, it’s still more expensive and weaker than say the Sengir Vampire, a Mephidross Vampire and Repentant Vampire. I can’t say he’s worth the cost as if you really want a vampire, there are better, older options. In a Sealed tourney though a flyer with an extra life is nothing to sneeze at. Now here’s a nice card. Two black for a 2/1 with Intimidate. Only black and artifact creatures can block it and there are always ways around both of those. It’s a nice simple card that you can get out right away as a repeat attack. If you’re opponent doesn’t have black or artifact creatures, it’s going to need direct damage or targeted attacks to stay in the game. Much like the previous Innistrad set, Dark Ascension brings into play several dual sided cards. These cards have no back and instead you put a proxy in your deck for it. When you draw the proxy, you can discard it and put the dual sided card into play by paying the correct mana cost. 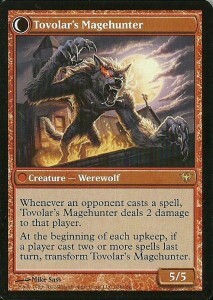 An example of what black has to offer is this card right here. For three mana, you get a 2/2 black creature. That’s a fairly standard card, right? Well if you tap Chosen of Markov AND another vampire card, you can flip this card over and transform it into Markov’s Servant. Now it’s a 4/4 black creature. 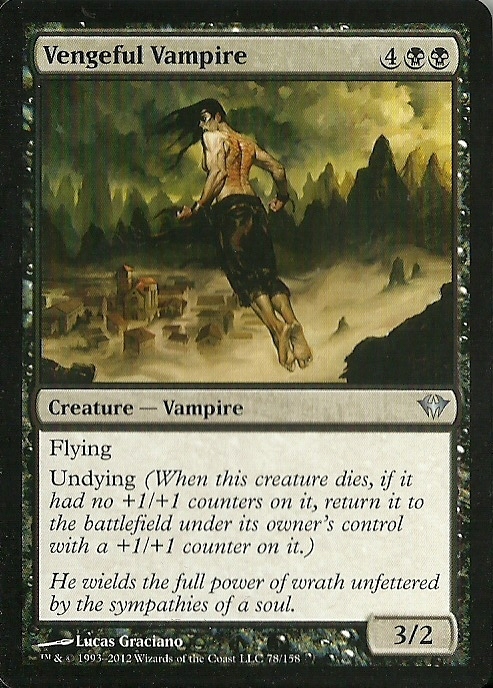 Unfortunately it doesn’t have any other special bits that we usually see on vampires like Flying or the ability to get +1/+1 counters when it kills something. Still, three mana for a 4/4 isn’t a bad deal all things considered. Going into this, I didn’t expect Red to be as powerful as it actually is in this set. Nearly every Red card impressed me (although there are a few stinkers). It’s going to be interesting to see what kinds of decks people come up with that use and abuse what Red has to offer. Now this is a nice card. 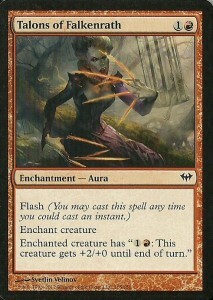 For two mana (One red and one colorless), you get an enchantment that can be played as an Instant. Talons of Falkenrath is basically a double up Firebreathing, For each colorless and red mana you tap, the creature with Talons of Falkenrath gets +2/+0 until the end of its turn. This is a nice way to either pump up a weenie or to make a creature with intimidate or a landwalk ability all the more threatening. Here’s a perfect example of a creature that can really make Talons of Falkenrath dangerous. For two red and a single colourless mana, you get a 1/1 creature with Double Strike. 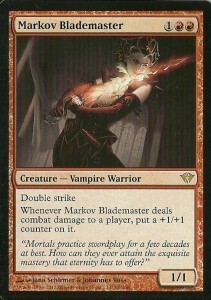 If that’s not all, Markov Blademaster gets +1/+1 every time it hits another player. Find away to give this Flying, Intimidate or a landwalk ability and you have a pretty nasty character. Of course the downside is that it’s expensive for a 1/1 creature and can be picked off as soon as it is played quite easily. Knowing when yo play this and seizing an opening in your opponent’s defense is key to making this work. Now this is one of the stinkers I mentioned earlier, for two mana, you’re basically getting a Lightning Bolt that is twice as expensive and can only be used properly in a white/red dual color deck. 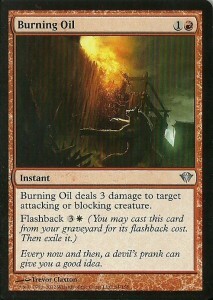 Even worse, it can only be used on creatures instead of also offering direct damage. Ick. Sure the Flashback ability sounds nice, but it’s four mana, and one of them has to be Whit. Not only is that an expensive cost for three damage, but again, you need a Red/White deck to even think of making this card work. Yuck. This is another dual sided card and it’s a pretty nice one. For four mana, you get a 3/2 creature. Sure you could do better than that. It’s still cheaper than a Vengeful Vampire though. The kicker is if there is ever a turn where no one casts a spell, it transforms into the pretty awesome Tovolar’s Magehunter. A 5/5 for four mana? That’s nice. I don’t think anyone will complain about that. The real kicker though is that anytime an opponent casts a spell from that point on, the Magehunter deals 2 damage to them. The only way to turn the Magehunter back into a Shaman is if two or more spells are cast in a turn. Which of course means, if your opponent wants to get rid of it, it either has to wait for you to cast a few spells against him or her, or they are willing to take between 2 and 4 damage. That’s a sweet Garou right there. As a treat for this first preview, I thought I’d highlight two of the Red/Black gold backed cards from this set. Remember when Gold = Legend? Wow I’m old. This, my friends, is an awesome card. For one black, one red and two colourless mana you get a 4/1 with Flying and Haste. You can sacrifice a creature to it at any time and it’s indestructible for a full turn. Better yet, if a human was sacrificed it gets a +1/+1 counter. So teaming this with a weenie deck (Why am I suddenly thinking of the old Breeding Pit enchantment) or a lot of humans means you have an effectively immortal killer on the loose. I love this thing and can see it getting a lot of use via creative players. This is a far superior vampire than either of the one’s we’ve looked at previously. It just requires a dual colour deck to make it work. Here’s another great vampire. 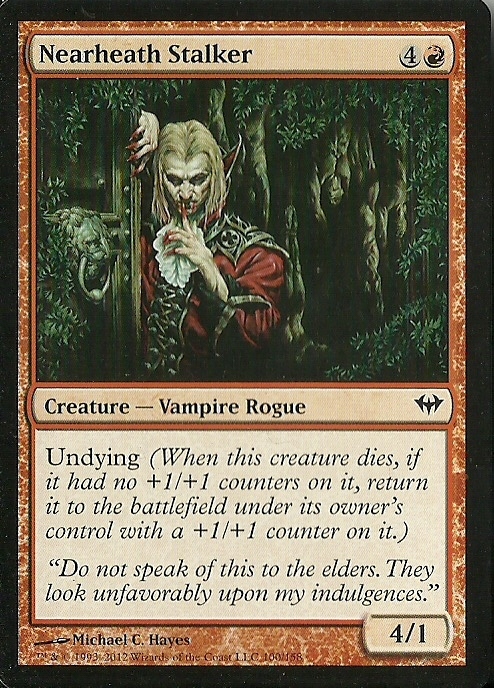 For three mana (one black, one red, one colorless) you get a 2/2 vampire. Three mana for a 2/2 isn’t that bad of a deal, but look what else you get. First off there’s first strike, making this a nice little striker. 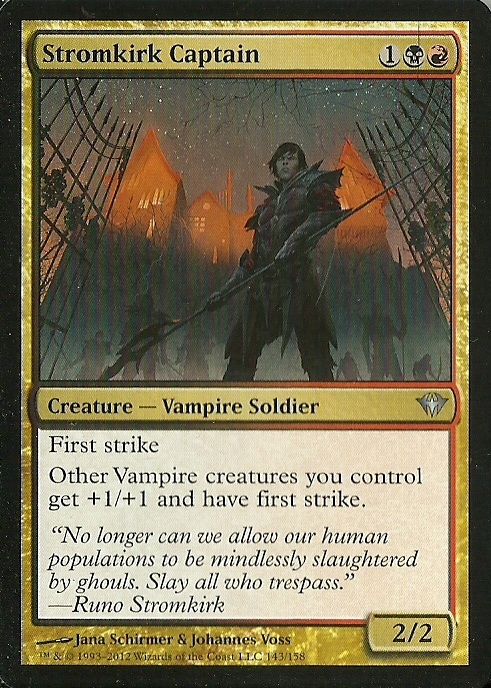 The real treat is that every other vampire you control gets +1/+1 andFirst Strike as well. Holy crap. Suddenly Vengeful Vampire is a 4/3 or 5/4 creature with Flying and First Strike. Nearhearth Stalker is a 5/2 or 6/3 creature with First Strike! 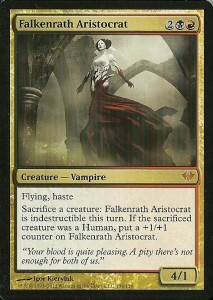 Falkenrath Aristrocrat? A 5/2 or 6/3 creature with Flying, Haste and First Strike, not mention the ability to be indestructible and gain +1/+1 counters. Suddenly the weak vampires become a whole lot better and the awesome vampire becomes something that will make your opponents cringe and swear at the same time. All for just three Mana. Put something that permanently raises the Captain’s toughness to protect it from direct damage and you have something that makes a wonderful centerpiece for a deck. There you have it. Just a sample of the Red and Black cards from the upcoming Dark Ascension set. We’ll be back tomorrow with a look at some Blue and Green cards for you. See you then!